Grapefruit (Citrus × paradisi) is a citrus fruit with a semi-sweet to bitter taste. It has a lovely refreshing fragrance and high nutritional content. It is rich in Vitamin A, lycopene, antioxidants, fiber, potassium and magnesium and so much more. The red and pink ones are especially rich in beta carotene. Grapefruit is known for its health and beauty benefits. The extract can provide anti-aging benefits, even skin tone and fight off free radicals. The high concentration of such goodness makes grapefruits ideal for face masks for oily skin and lip scrubs for lips in need of care. In the beauty industry, its often added to creams and lotions to help treat acne and prevent oily skin. Grapefruit oil is derived from cells within the rind and contains up to 95% limonene. When inhaled, the oil can help ease headaches, mental fatigue, depression and hangover symptoms. The oil fragrance is a great mood booster and eliminates odors. Health BenefitsThe beta carotene in the red and pink fruit help keep eyes healthy and improve vision. The antioxidants in grapefruit help reduce cholesterol levels. The vitamins in this super fruit help to keep gum healthy. A grapefruit a day will hugely benefit you healthwise. Renews damaged skin : The vitamin C and antioxidant protect skin from free radicals. In addition, it stimulates collagen production which improves skin smoothness and elasticity as well as help even skin tone. The astringent and exfoliating properties it possesses are perfect for oily or acne-prone skin. 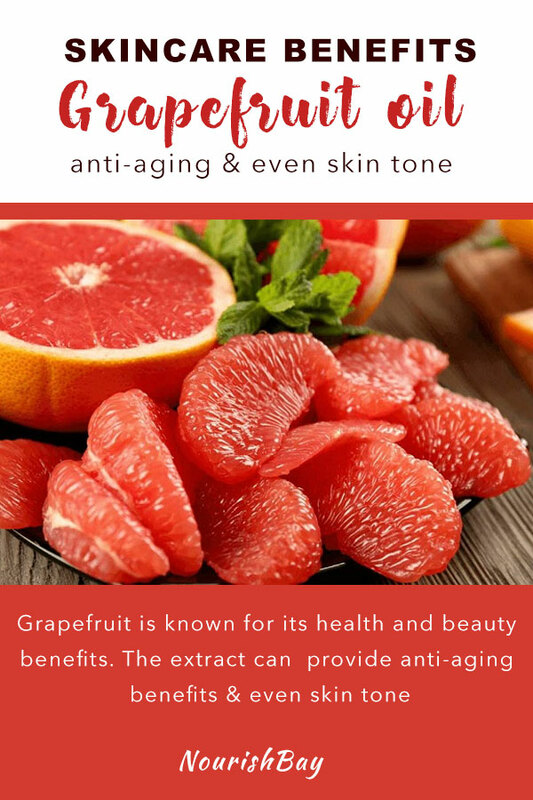 Using grapefruit in skincare also increases the pH of the skin, which in turn can help reduce acne. The scent of grapefruit is mood uplifting and soothing bringing about a sense of peace and relaxation. It’s also considered a natural stress reliever with anti-inflammatory properties from the limonene. In addition, it helps alleviate fatigue and muscle aches. The antibacterial properties help kill skin bacteria and fungus.